Home > Frauds, Bankruptcies and Scandals > WorldCom, Inc. Beautifully engraved certificate from the WorldCom, Inc. . This historic document was printed by the Security-Columbian United States Banknote Company and has an ornate border around it. This item has the printed signatures of the Company’s President. WorldCom Inc. filed for Chapter 11 bankruptcy protection according to the company's chief executive John Sidgmore. The bankruptcy is the largest in U.S. history and the latest in a spectacular series of corporate collapses. The filing took place in U.S. Bankruptcy Court in Manhattan, and it ensures that the company receives about $2 billion in financing while it reorganizes. WorldCom admitted June 25 that it had falsely booked $3.85 billion in expenses to make it appear more profitable. The same day, the company fired chief financial officer Scott Sullivan, who was later accused by company auditor Arthur Andersen of withholding crucial information about WorldCom's bookkeeping. WorldCom also announced layoffs of 17,000 workers, or 20 percent of its global work force. The bankruptcy is twice as large as Enron's record-setting filing in December and four times as big as Global Crossing's in January. Worldcom reported more than $100 billion in assets at the end of March but is burdened by $30 billion in debt. Even before the hidden expenses were exposed, WorldCom was struggling. Its stock traded as high as $64.50 in mid-1999. But shares of WorldCom and other telecommunications companies have slid ever since as the dot-com bubble burst and other market forces caused an industrywide implosion. CLINTON, Miss., July 21 /PRNewswire-FirstCall/ -- WorldCom, Inc. (Nasdaq: WCOME, MCITE) today announced that WorldCom and substantially all of its active U.S. subsidiaries filed voluntary petitions for reorganization under Chapter 11 of the U.S. Bankruptcy Code in the United States Bankruptcy Court for the Southern District of New York. Chapter 11 allows a company to continue operating in the ordinary course of business and to maximize recovery for the company's stakeholders. The filings will enable the company to continue to conduct business as usual while it develops a reorganization plan. WorldCom's non-U.S. subsidiaries are not included in the filing and will also continue to operate normally. WorldCom also announced that it has obtained an agreement to arrange up to $2 billion in Debtor-in-Possession (DIP) financing. The company already has secured a commitment of $750 million of this amount from Citibank, N.A., JP Morgan Chase Bank and General Electric Capital Corporation. This facility is being arranged by Salomon Smith Barney Inc., JP Morgan and General Electric Capital Markets Group, Inc. The facility will be used to supplement the company's cash flow during the Chapter 11 proceedings and is subject to approval by the Bankruptcy Court. Once approved, the arrangement will provide an immediate source of funds to WorldCom, allowing the company to operate its business normally while it focuses on its new strategic plan, restructures its finances, reduces its debt burden and strengthens its balance sheet. This additional liquidity will enable the company to satisfy customary obligations associated with the daily operations of its business, including the timely payment for new services, employee wages and other obligations. "Chapter 11 enables us to create the greatest possible value for our creditors, preserve jobs for our employees, continue to deliver top-quality service to our customers and maintain our role in America's national security," said John Sidgmore, president and chief executive officer of WorldCom. "We will use this time under reorganization to regain our financial health and focus, while operating with the highest integrity. We will emerge from Chapter 11 as quickly as possible and with our competitive spirit intact." WorldCom currently employs more than 60,000 people in 65 countries and serves over 20 million residential and business customers. It also operates the world's largest Internet network. "Our total focus will be to take this company forward in the best way possible and with the highest ethics so that WorldCom can continue to be an important part of our economy. To that we are totally committed," said Sidgmore. To this end, WorldCom announced the election of two new members to its Board of Directors; Nicholas deB. Katzenbach and Dennis R. Beresford. Mr. Katzenbach currently is a private attorney and previously served as Attorney General of the United States (1965-66), Under Secretary of State for the United States (1966-69), and as Senior Vice President and General Counsel of IBM Corporation (1969-86). Mr. Beresford currently is Professor of Accounting at the Terry College of Business, University of Georgia and previously served as Chairman of the Financial Accounting Standards Board (1987-97). Mr. Katzenbach and Mr. Beresford have not previously been involved in the company's affairs. Following their election as Directors, Mr. Katzenbach and Mr. Beresford were appointed to a Special Investigative Committee of the Board to conduct an independent review of the Company's accounting practices and preparation of financial statements. This Special Committee will take on the oversight role with respect to the previously-announced investigation led by William R. McLucas into these matters. "The additional board members of this caliber demonstrate our seriousness in attracting independent board members and establishing a quality governance structure for our corporation. Their willingness to serve is also an indication of the importance of our company's future," said Sidgmore. WorldCom which once topped $64 a share had become the most heavily traded stock in a single day in U.S. history as the markets tumbled again. During the day, 1.47 billion shares of WorldCom traded, at prices as high as 15 cents and as low as 5 cents. Sales were in the 6-cent range Tuesday. Bush, who has denounced irresponsible corporate behavior nearly every day since the WorldCom affair came to light, said in a speech in Cleveland on Monday: "By far the vast majority ... of corporate America are aboveboard and doing their jobs just the way you'd expect them to do. ... It's also important to know we're going after those who aren't and hold them accountable." WorldCom, which owns MCI, is second only to AT&T in the long-distance market. 6/25/2002 6:40:44 PM NEW YORK, June 25 (Reuters) - Shares of WorldCom (WCOM) sank like a rock in after-hours trade on Tuesday following a news report that the beleaguered telecommunications giant has allegedly engaged in massive fraud that may force it to file for bankruptcy. Shares of WorldCom (WCOM) lost nearly 60 percent of their value in Tuesday's extended session after CNBC and The Wall Street Journal reported that the troubled telecom carrier misrepresented costs in a massive accounting fraud and will be forced to restate EBITDA for the past 5 quarters. The reports said that Worldcom's board fired its chief financial officer, Scott D. Sullivan and that the overstatement could be as much as $3.5 billion. 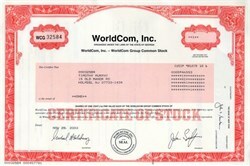 WorldCom plunged to 36 cents a share on the Instinet system from a close of 83 cents on Nasdaq. David Faber, a correspondent for the CNBC financial television network, quoted sources close to WorldCom as saying the company has inflated earnings before interest, depreciation, taxes and amortization, or EBIDTA, by about $3.6 billion, and will soon restate its financial statements. CLINTON, Miss. April 30, 2002 — Bernard J. Ebbers, who built WorldCom Inc. into a global telecommunications giant but then saw its fortunes and stock price crumble amid fierce industry competition and questions about the company's finances, has resigned as chief executive and president. WorldCom said Tuesday that vice chairman John Sidgmore would succeed Ebbers in both positions. Bert Roberts remains chairman. WorldCom, one of the darlings of Wall Street a few years ago, has seen investors turn against it in recent months amid concerns about the company's $28 billion in debt and an ongoing Securities and Exchange Commission investigation into loan and accounting practices. Its long-distance business, the nation's second largest after AT&T Corp., has also come under pressure from industrywide price discounting. WorldCom's stock, which has lost some 80 percent of its value this year, closed Monday at $2.35, down 92 cents, on the Nasdaq Stock Market. It traded at a high of $64.50 in June 1999. MCI WorldCom knows how to make mergers work. The Company started as a long distance reseller in Mississippi, called Long Distance Discount Service (LDDS). There is a famous--and true--story about the early days. LDDS Corporate Headquarters Brookhaven, MS 1983 In September 1983 businessmen Murray Waldron and William Rector met in a Hattiesburg coffee shop to discuss a business plan for a long distance reseller. When a waitress at the restaurant asked the two gentlemen if they needed more iced tea, Murray responded, "No, but we do need a name for the new company we're planning." After inquiring about what kind of company it was, the waitress walked away for a few minutes and came back with a napkin on which she had scribbled the letters "LDDC"-Long Distance Discount Calling. The name was later changed to LDDS-Long Distance Discount Service. And Bernie Ebbers, an early investor, became CEO in 1985. In November 1983 LDDS was certified by the Mississippi Public Service Commission to operate as a long distance carrier. The first customer was the University of Southern Mississippi. The Company grew both internally and through mergers with other telecommunications companies and expanded operations from its Mississippi base. LDDS went public in August 1989 through its acquisition of Advantage Companies, Inc.
1992 Advanced Telecommunications Corporation, a long distance reseller based in Atlanta, Georgia. This stock for stock acquisition was valued at approximately $850 million. 1993 Metromedia Communications Corporation ("MCC") and Resurgens Communications Group, Inc. MCC, based in East Rutherford, New Jersey, and Resurgens, based in Atlanta, Georgia, both were full service long distance providers. These transactions completed with both stock and cash, were valued at approximately $1.25 billion. 1994 IDB Communications Group, Inc. IDB operated a domestic and international communications network providing private line and public switched long distance telecommunications services, facsimile and data connections, television and radio transmission services, and mobile satellite communications capabilities. This stock for stock transaction was valued at approximately $936 million. 1995 The network services operations of Williams Telecommunications Group, Inc. ("WilTel"). WilTel owned 10,000 miles of fiber and 1,000 miles of microwave transmission facilities, which gave the new company the capability to serve even the largest companies with both voice and advanced data capabilities. This cash transaction was valued at approximately $2.5 billion. In May 1995 LDDS changed its name to WorldCom, Inc.
1996 MFS Communications Company, Inc. ("MFS"). Through this acquisition, the Company acquired local network access facilities via digital fiber optic cable networks installed in and around major United States cities, and in several major European cities. The Company also acquired a network platform, which consists of Company-owned transmission and switching facilities, and network capacity leased from other carriers primarily in the United States and Western Europe. This stock for stock transaction valued at approximately $12 billion gave the Company end-to-end bandwidth, global networks, and accelerated the Company's revenue growth. MFS had previously acquired UUNET Technologies, Inc., a leading worldwide provider of a comprehensive range of internet access options, applications, and value added services to businesses, other telecommunications companies and online service providers. The year 1998 was highlighted by the completion of three multi-billion dollar merger transactions: MCI Communications Corporation, Brooks Fiber Properties, Inc., and CompuServe Corporation. These mergers build on a long and successful track record of completing and integrating some 65 separate mergers and acquisitions since the Company was created in 1983. And like the mergers before them, last year's mergers are already adding incrementally to internal revenue growth. The 1998 mergers added significant scale to the Company and consolidated its leadership position in communications services. One important advantage of size is that the risks associated with doing business in a highly competitive industry are spread over a broader range of markets and geographies. At the time it was announced in 1997, the merger with MCI, valued at approximately $40 billion, was the largest in history. The year 1998, however, was an extraordinary year for mergers. Fortune Magazine calculated the total value of all the mergers announced in 1998 at $1.6 TRILLION. By the end of 1998, the MCI WorldCom merger ranked as only the eighth largest in history. Yes, the merger with MCI was big. But bigness by itself was not the objective. The merger made sense in two other key ways. First and foremost, it led to increased shareholder value because the power and efficiency of the merged company are greater than the two companies working separately. Thus, value was captured in the anticipated synergies, which were already evident in the first full quarter following the merger completion in September 1998. Second, it joined two companies with highly complementary strengths and assets. Both companies were leaders in transforming the industry from a monopoly utility business into an intensely competitive market. The integration of the two companies is well underway. Network operating efficiencies have resulted from the combined networks through reduced leased line costs and the avoidance of expensive termination charges internationally and domestically. Sales and marketing forces have been meshed. "Best practices" have been adopted, and duplication is being eliminated. The other 1998 acquisitions were important and should not be overshadowed by the dollar magnitude of the MCI transaction. The Brooks Fiber acquisition brought forty new and highly complementary local exchange markets to the Company, accelerating our local city expansion into new markets by one to two years. MCI WorldCom now offers local service in 102 domestic US markets. The CompuServe merger and the purchase of ANS from AOL enhanced the Company's Internet and systems integration capabilities.